Your mind will turn to career, reputation, and recognition you receive, thanks to the Sun’s journey through Aquarius and a stunning new Moon in this sign as of February 4. You’re likely to spend more time at work or participating in community activities. You also will want to pay more attention to finances, especially early in the month. So it’s a great time to apply for awards that have a cash prize or evaluate your work life and consider some exciting changes if you wish. Seek out colleagues, bosses, and employees to strengthen relationships or even socialize during the first half of the month, perhaps with a group charitable initiative. Be tolerant of others’ quirks and celebrate your differences because their uniqueness can help your career in ways you may not realize. The full Moon on February 19 will bring developments related to your children, a creative project, or your romantic life. You may see a breakthrough in a child’s activities, hear news about an arts project, or have a realization that leads you to make a relationship more serious. Pay attention to information that comes to light at this powerful time. On February 18, when the Sun enters Pisces, the focus will shift to your relationships. After long hours at work, you’ll be ready for fun with friends (and making new ones). It’s also a great time to attend events to make new business connections, join a club, or volunteer for a charitable organization. Organize your processes for managing work contacts and sales leads to keep track of all the creative people you meet. Your hopes and dreams about making the world a better place may become more important to you now, so seek out likeminded others and work together on a fundraiser or other project. February 14 brings Valentine’s Day here in the U.S. as well as many other countries. If you’re in a relationship, enjoy passion with your sweetheart. If you’re unattached, go out with coworkers or attend a travel seminar or a university event because you’ll have fun and may meet someone. And speaking of fun, for many people, Valentine’s Day isn’t complete unless it includes chocolates. I’ve created a Chocolates Chooser that gives you your chocolate profile based on your zodiac sign. Check it out and treat yourself (and your amour) to some sweet goodies this month! Click Now For Chocolates Chooser! 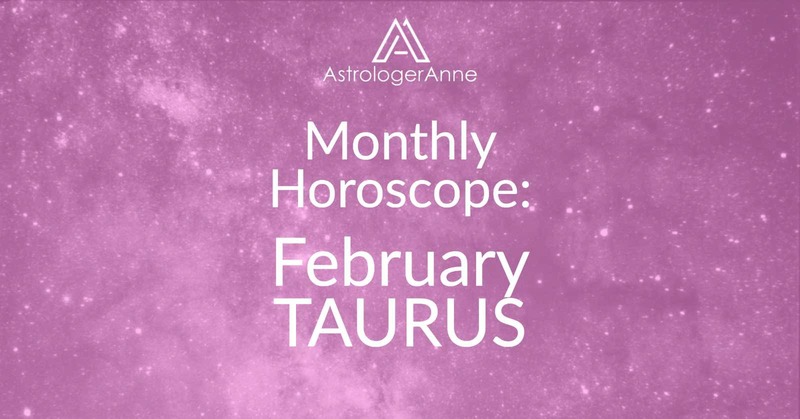 Happy February, Taurus! I wish you a wonderful month! P.S. - Find Out More With A Report! Anne Nordhaus-Bike is a longtime professional astrologer and popular speaker. She's also an award-winning astrology journalist. Anne lives and works in Chicago, where she's a frequent and popular guest on radio, sharing what's in the stars with listeners. When Did Anne Start As An Astrologer? Anne first learned astrology from her father when she was a child. She's now been a professional astrologer for decades.